When deploying a testbed infrastructure for Wireless Sensor Networks (WSNs), one of the most challenging features is to provide repeatable mobility. Wheeled robots, usually employed for such tasks, strive to adapt to the wide range of environments where WSNs are deployed, from chaotic office spaces to neatly raked potato fields. For this reason, wheeled robots often require an expensive customization step in order to adapt, for example, their localization and navigation systems to the specific environment. To avoid this issue, we present Gondola, a parametric robot infrastructure based on pulling wires, rather than wheels. Gondola avoids the most common problems of wheeled robots and easily adapts to many WSNs’ scenarios. Different from existing solutions, Gondola can easily move in 3-dimensional space, with no need of a complex localization system and with an accuracy that is comparable to o-the-shelf traditional robots. the topology changes due to link dynamics and node mobility. 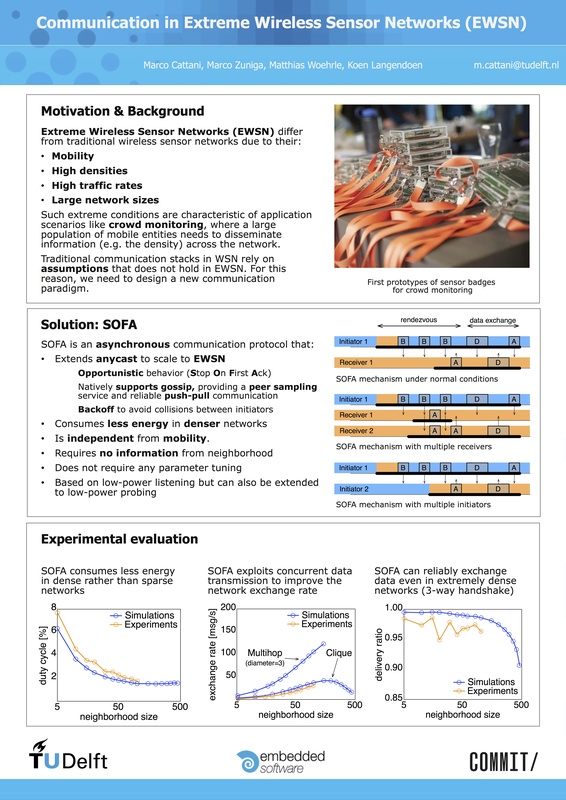 Unlike traditional approaches that maintain a routing structure (e.g., a tree), opportunistic schemes forward packets to the first neighbor that wakes up, thereby reducing latency and energy consumption and increasing the robustness to network dynamics. on two testbeds. Our results show that, across the board, Staffetta reduces packet latency by an order of magnitude while halving the energy consumption at minimal overhead. In some cases the impact is even more profound. Compared to using ORW alone, adding Staffetta can lead to network lifetimes that are six times longer and end-to-end packet deliveries that are 450 times faster. In other words, by smart duty cycling, Staffetta improves opportunistic data collection basically for free.